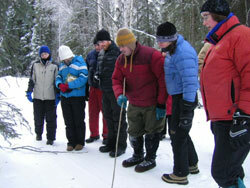 The Alaska Department of Fish & Game offers hands-on training opportunities to educators, both formal and non-formal. Topics of past workshop topics include: Bats and Frogs!, Antlered Ungulates, ArcGIS Story Mapping, Alaska Animals, Wetlands, School Yard Habitats and more! These fast paced and fun workshops help to connect you and your students learning to Alaska relevant species and circumstances that are right in our backyard. Continuing education credits are available from the University of Alaska System and Alaska Pacific University. For more information, visit our course calendar or contact an ADF&G education specialist in your region. You can also sign up for our list-serv to have information about upcoming teacher workshops delivered to your e-mail. Get training in how to teach K-12 students about Alaska’s wildlife, ecology and resource conservation. This national award-winning conservation and environmental education curricula emphasizes wildlife and is designed for Pre-Kindergarten through 12th grade students. This popular archery program is integrated into a school’s physical education program. Become involved in ADF&G’s Hunter Education and Training Program (HIT) and teach others. These workshops concentrate on background content of a particular theme with guest speakers, participation in research or a number of other unique opportunities. Teachers leave with more in-depth understanding and knowledge of various subjects. Field investigations and place-based learning activities are demonstrated to help teachers engage their students and connect them with the natural world. Participants receive teaching resources including curriculum and other materials as part of the workshop materials fee. Themes are always changing so check out the ADF&G education webpage for a complete list of Beyond Wild Workshops.